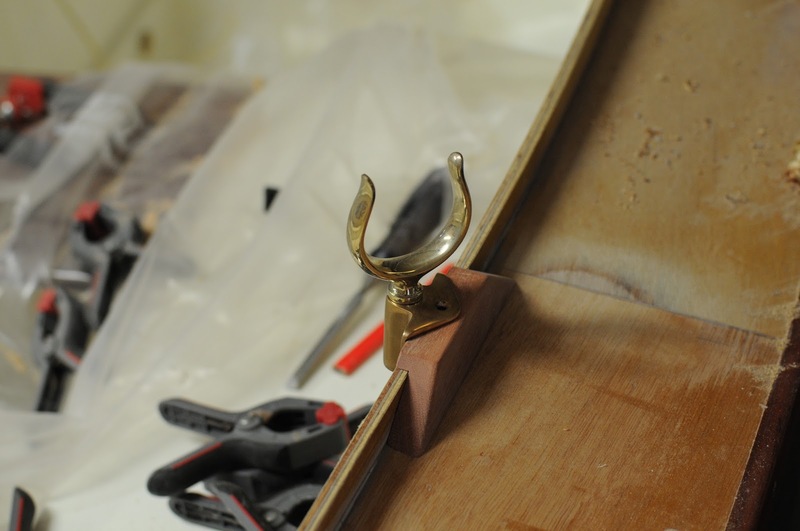 Suzy's Blog: Last coaming piece. 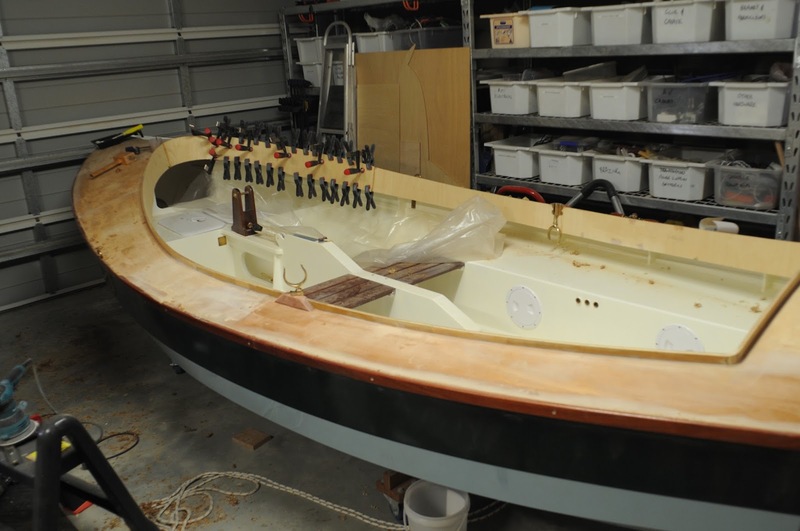 Today I put the very last coaming piece on the boat. Now that I think of it, it's also the last piece of plywood. All subsequent bits of wood (spars, rudder) will be solid. The second layer of coaming progressed very slowly, as I needed lots and lots of clamps for each piece. 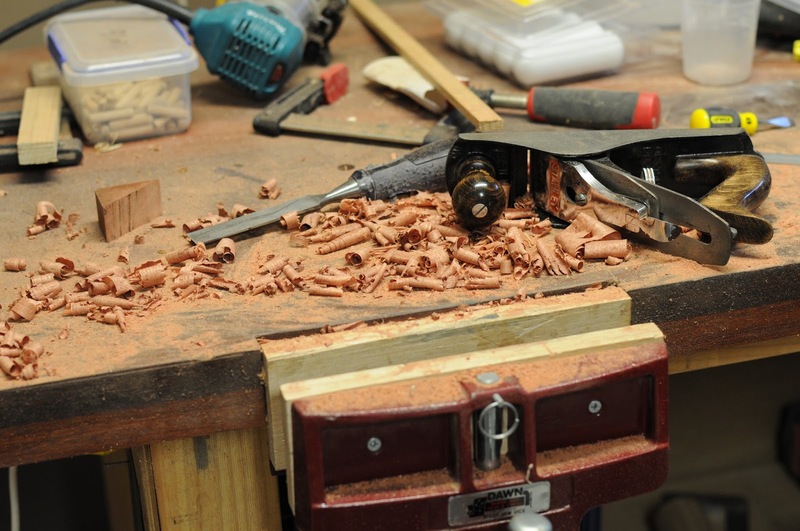 While waiting for pieces to set up I shaped other areas of the coaming and made some mounts for my nice bronze row locks from Jarrah. This was fun, as they're a complex shape (practically no 90 degree angles here) and necessitated lots of delicate plane work. They're held down with two #10 x 50mm screws from under the deck, plus epoxy. When I put the rowlocks in, there's four #8 x 25mm screws through the coaming into these blocks, plus an additional #8 x 38mm screw from on-top. The rowlocks are thus very solidly located to the boat. The angles are rounded out and bum friendly, and I've raised the rowlocks by about 8mm from our initial test with Perry pretending to row. I think the rowing ergonomics should be reasonably good. It's still a big (wide) boat to row, but I reckon I've done everything I can. 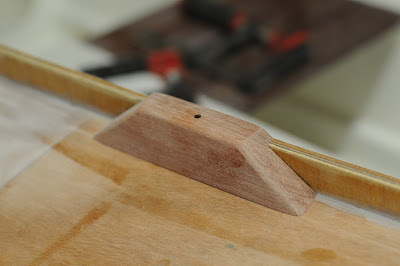 Doing the final shaping on the coaming is easy on top, as there's plenty of room to plane and my Stanley no. 4 and spokeshave work really well. Alas it's rather harder underneath, as there's not enough space between cockpit seats and coaming to get the no. 4 in. I very nearly pulled the pin on a low angle block plane, but figured for this job a simple piece of coarse emery on a wooden block will suffice. That leaves me a little more money for the enormous pile of blocks that I now have to buy.